Here is the guest bath reveal from our new house. Hello, everyone. We are back today with another room to show you. 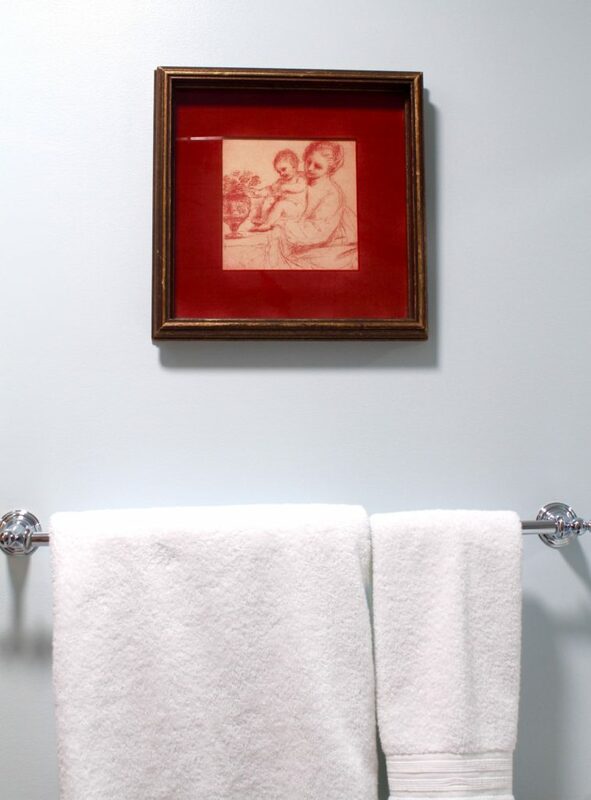 It’s time for the guest bath reveal. 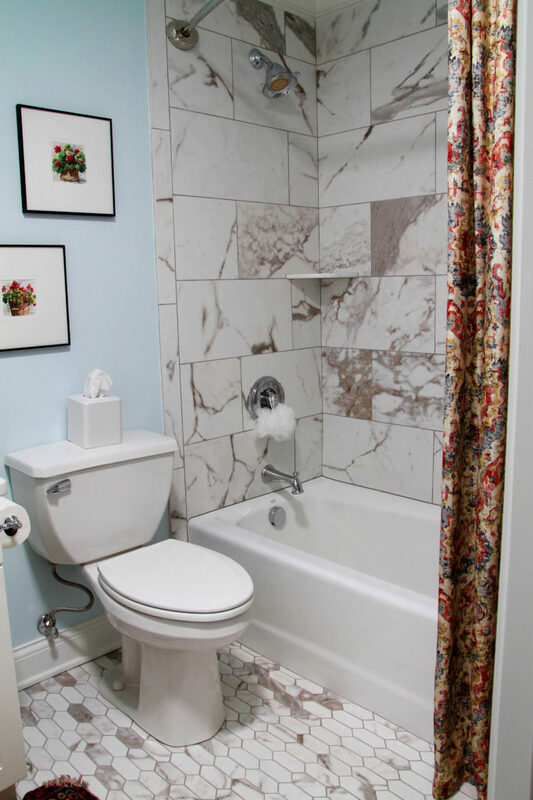 This bath is on the second floor and is one of four full baths in the house. 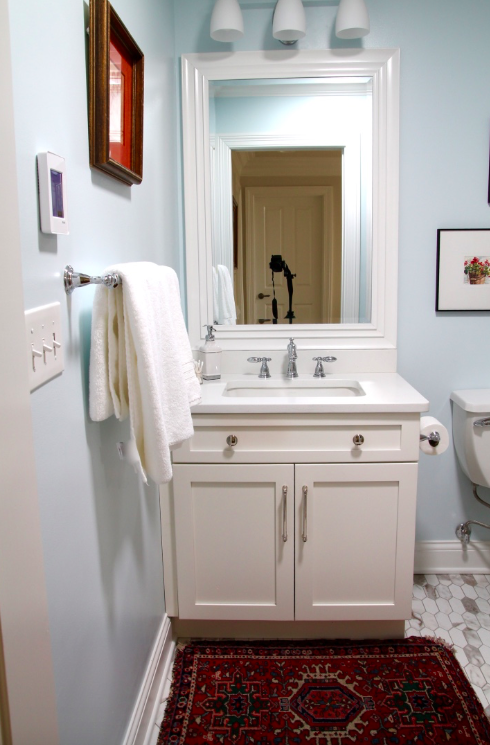 We reduced the size of this bath and used that stolen space in the new laundry room that we created. Originally, this bath had a double sink and a wall between the sinks and the toilet and bath/shower. It now has one sink, the wall is gone, and the sink, tub, and bath/shower are all in the same space. It is small but efficient. This room has no window so we had a solar tube installed, and it is providing all of the light for these photos. And the nice thing is that the solar tube uses stored up energy and becomes a night light when the sun goes down. We had three of them installed in various parts of the house. The wall color is Iceberg by Sherwin Williams. It is a very soft blue that gets lighter or darker depending on the time of day and the amount of sunshine outside. This was the third color that was on the wall. The white I originally wanted was too white, the stucco at 50 per cent was too creamy, and this was just right. Thanks to our painters who put up with me and my indecision on this wall color. When the tile man finished the tile in this shower, he called me and asked me to come take a look. He said, “You aren’t going to like it.” He was right. Combined with the floor, it was too much. When I left the house, I had just a sick feeling in my stomach, and within 10 minutes, I called him and told him to stop there. 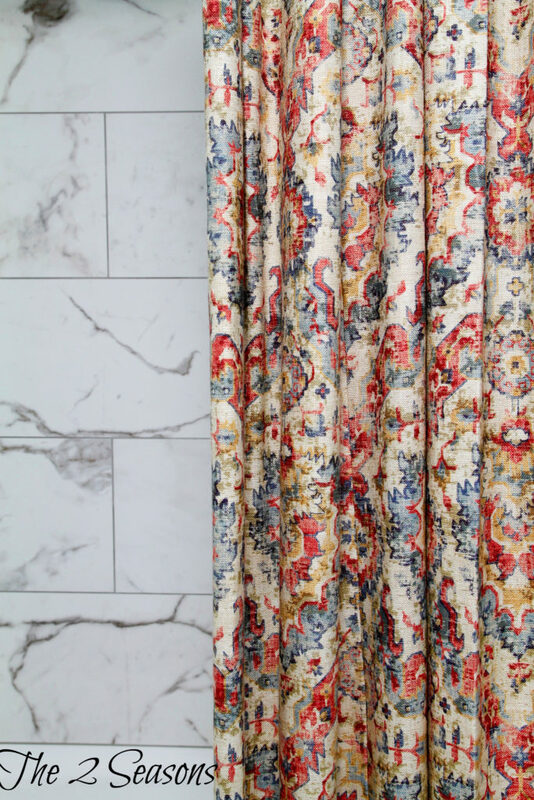 The next morning I was at our tile supplier when they opened, and ordered a new tile for the remaining two bathrooms where we had planned to use the same loud tile on the shower walls. We kept it in this room, and I have adjusted to its loudness. Also, we used some of it for our laundry room floor, which was not the original plan. However, it would have been foolish to buy more tile for the laundry when we had tons of this left over. I LOVE it in the laundry room and will be showing you that room soon. My local fabric shop ordered this linen fabric for me, and I used this method to make the shower curtain. I really am pleased with the way it turned out. 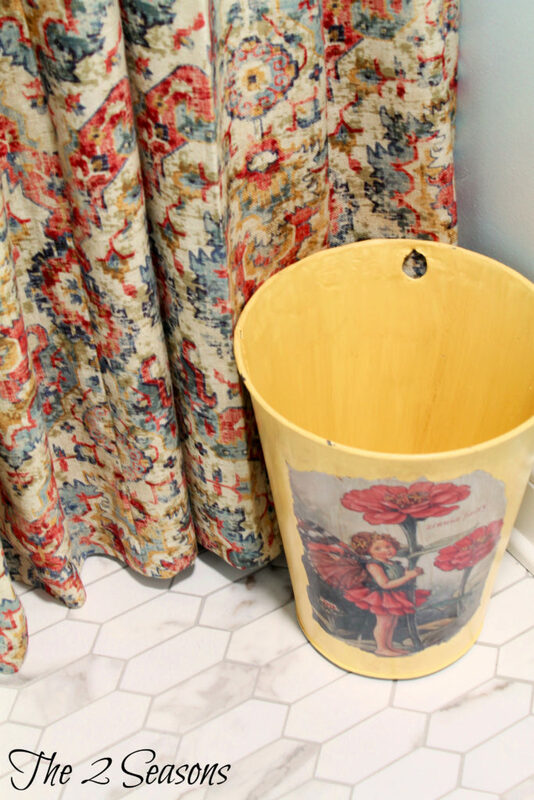 This old sap bucket that I painted and decoupaged is a good waste basket in this room. 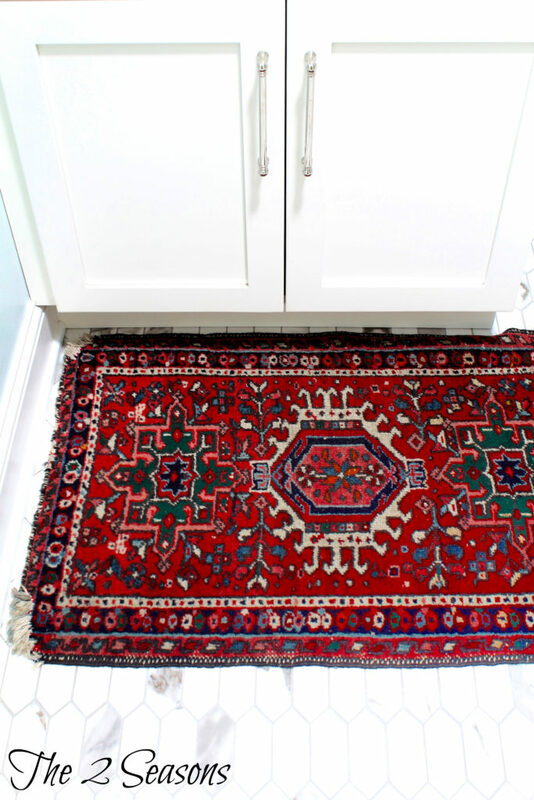 This rug, which I bought on ebay, was in the powder room of our last house. All of the cabinets in the entire house are the shaker style with polished nickel hardware. The fixtures are the Victorian line by Delta. I think it is a classic look that will always be in style. All of the art is original. I bought these two ladies in Cuba. This is an antique pencil drawing. These are original watercolors that I bought at an art fair. 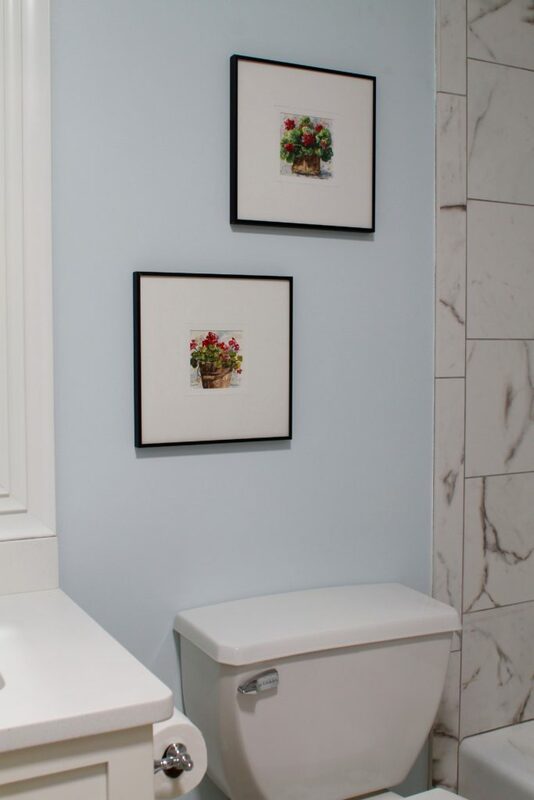 I hope you enjoyed seeing our guest bath reveal. Stay tuned for more room reveals. Love the artwork. A suggestion . . . Have you thought of selling your excess tile via Craigslist or Offer Up? Your financial outlay on the tile might be mitigated somewhat that way. Thank you. Yes, we are going to list it on Craigslist and FB Marketplace. We took inventory of it. I just haven’t done it yet. Lazy….. Very nice job. 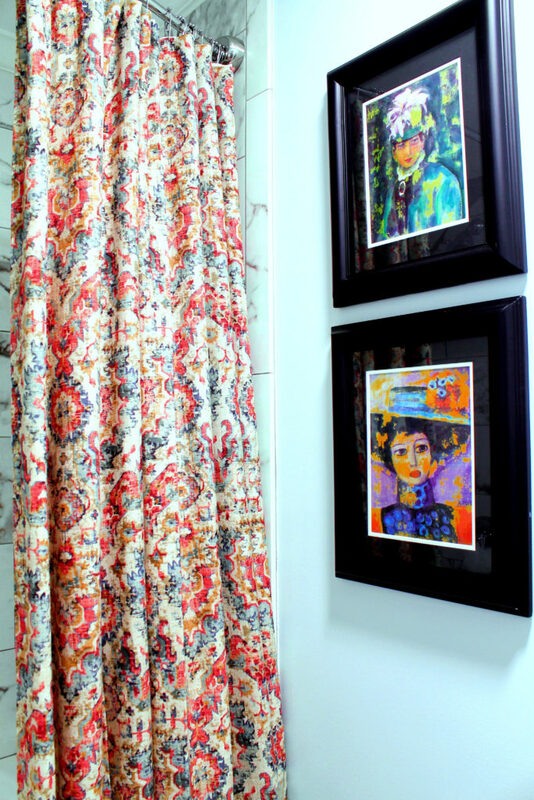 Love the shower curtain pattern and colors, and the art ties in beautifully. I didn’t know you didn’t like the two tiles together. You know me … love it!! I can live with it but am glad I chose another tile for the other bathrooms!